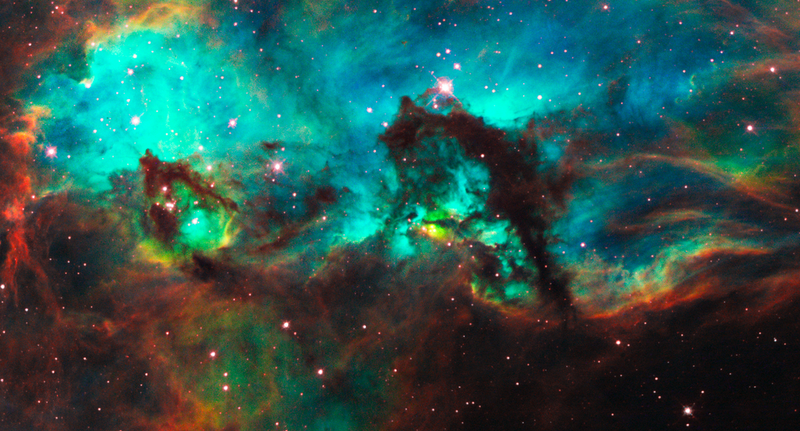 Stars are volumes of gas that emanate light through a process called nuclear fusion. 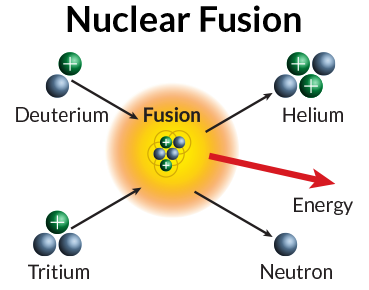 Essentially, fusion takes place when smaller atoms or atomic particles are combined together under extreme temperatures and pressures, to build bigger atoms. For most smaller elements, this process creates more energy than it uses, and often this energy is in the form of heat and light. Magnitude can be expressed in two ways; their apparent magnitude, or their absolute magnitude. This is because how bright an object is to our eye depends on both how intrinsically bright the object is, and how far away it is. The greater the distance from us, the weaker the light becomes - this is known as the inverse square law; where energy of light is spread over a larger area as distance increases. ​Apparent magnitude is how bright the object appears to be from our perspective here on Earth; this means that their brightnesses are affected by how far away they are. ​Absolute magnitude is how bright they would be if each of the objects were at a consistent distance from us. This is a fairer comparison as distance is taken out of the equation. Values of magnitude have no units because they are calculated using ratios of luminosity; and ratios cancel out units. 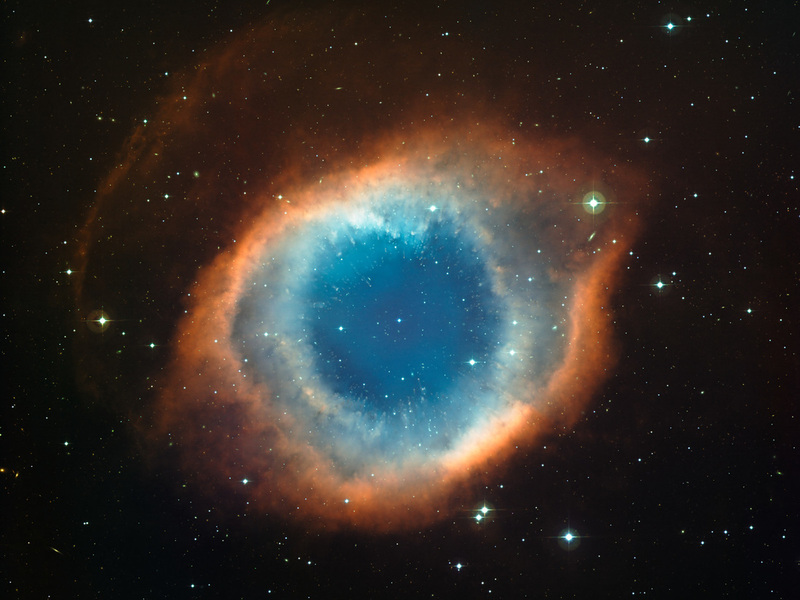 Stars come in a variety of colours ranging from red, orange, yellow, white and blue. 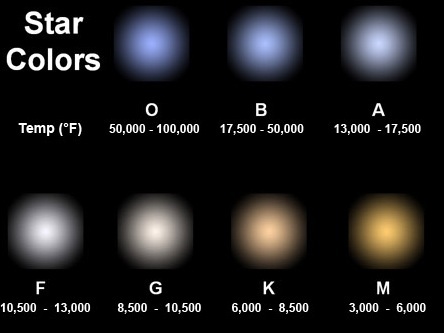 These colours correspond to the surface temperatures of the stars - with cooler stars appearing more red, and hotter stars appearing more blue. In fact, you can make estimations on their surface temperatures just by examining colours of light emitted by them. Graph of black-body radiation: the skew of each curve moves closer towards the blue part of the visible light spectrum as surface temperature rises (temperatures shown here are in Kelvin K). Stars are categorised by their colour, into 'Spectral Classes', O, B, A, F, G, K, and M. Note that the temperatures (here in Fahrenheit, F), drop as the star becomes more orange. a green filter on (V) - letting in mostly the green light through. If a star is really blue, then your image sensor would get a high signal through the blue filter, and less so with the green filter. If a star is really red, then the image sensor would read a very low signal through the blue filter, and a higher signal from the green filter. By comparing the light intensity (magnitude) of light through these two filters, we can get an estimation of the star's colour, hence the B-V colour index; where B=blue light signal, V=green light signal (where green is an approximation of 'visible' light, hence 'V'). 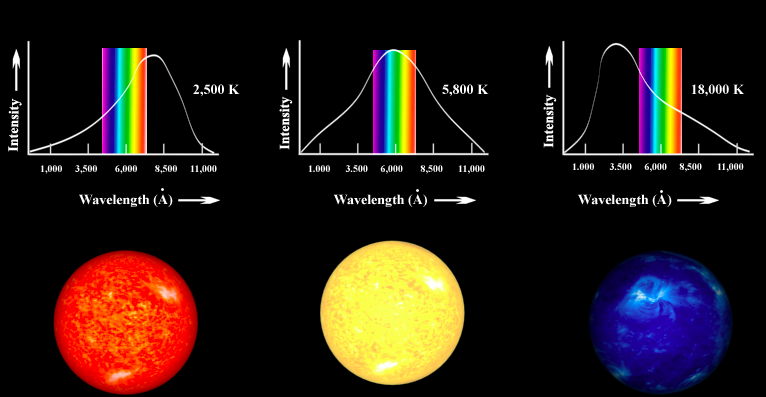 Hence, B minus V.
Once we have the B-V colour, or surface temperature (K) of a star, we can classify them into Spectral Types/Classes (see this link for a table). Infographic from Khan Academy. Click on the picture to download the full size PDF. ​Similar to a 'choose your own journey' novel, the path that a star will take as it ages depends on its initial size or mass. Smaller mass stars fizzle out rather uneventfully, whereas the very large ones go out with a spectacular bang. ​Here is a more simplified view of a star's lifecycle - starting from the 9 o'clock position, and moving clockwise. Along the way it shows small branches off (brown dwarfs, neutron stars, black holes etc) but it doesn't show the circumstances that causes those outcomes quite like the Khan Academy infographic above. Stars start out from nebulas - large collections of gas (predominately hydrogen) and dust, which can coalesce under forces of electrostatic attraction, and gravity. Areas within the nebula become dense - which increases the pressure and temperatures of the gas in that area. The very low initial temperatures (~20 K, University of Oregon) of the gases found in nebulas allow them to coalesce, since they would otherwise fly apart from their kinetic energy at higher temperatures. As with any gas, these dense regions will then rise in pressure and temperature as they compress, but are now held together due to more gravity. For any two objects affected by gravitational force, the force is greater with increasing mass (m₁ and m₂), but weaker with distance (r). Theoretically, gravity should always be pulling objects together no matter how far apart. It is just very weak for far distant objects. 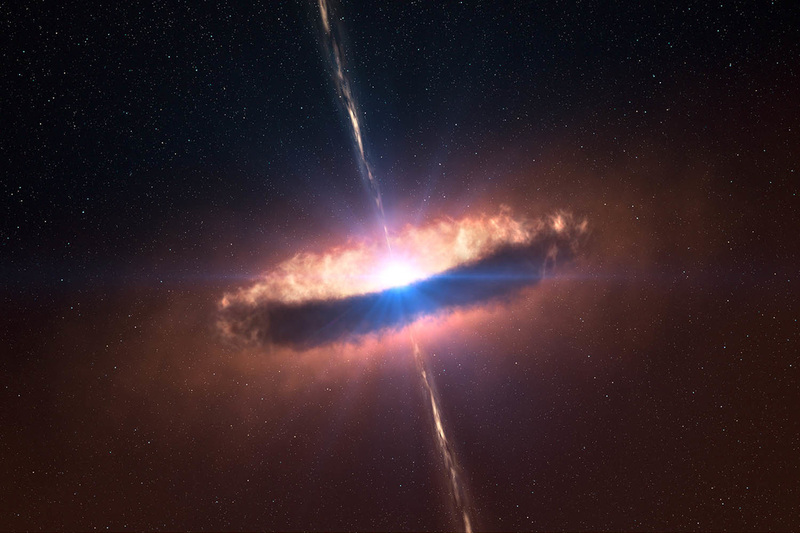 When the temperature and pressure gets high enough, the hydrogen and dust can begin nuclear fusion and thus a star is born; a protostar. The star then becomes a main sequence star - a similar stage in a star's development as an adult in a human's life. Here it continues to fuse its supply of hydrogen gas in its core - where the density, pressure, and temperature is the highest in the star, fusing hydrogen into helium. As more helium is produced, it sinks into the core and gradually builds in quantity. This page is a WIP and so is yet to be completed: main sequence stars, red giants etc..